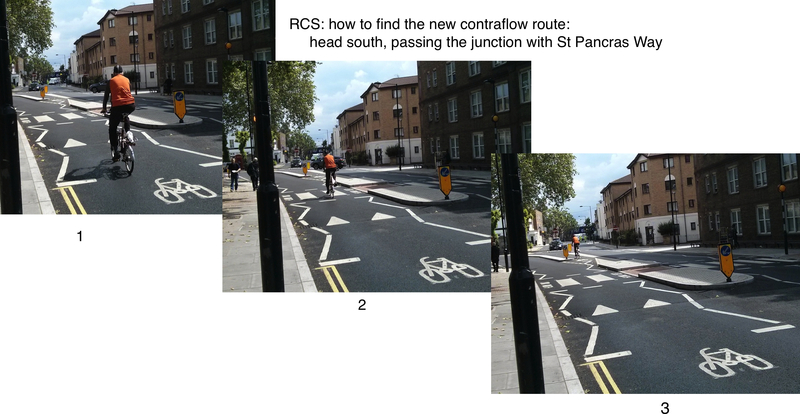 the junction of Royal College Street and St Pancras Way where southbound cycles will be going straight ahead while all motor traffic is turning left; a variety of solutions were discussed. There are stepped tracks on both sides of the road; separate cycle signals for crossing Camden Road and an experimental narrow section to enable people to cycle southbound past the junction with St Pancras Way. The pity is that this mainly excellent scheme has been marred by the loading bay on the NB route and that ‘hours of operation’ have not yet been posted (19 June 2016), nor are there any dropped kerbs to get on and off the track. We will carry out an ‘informal audit’ towards the end of June. The scheme implemented was modified due to the problems described below. The changes are mostly for the best. But Camden Council agreed to install an off-peak loading bay on the NB route – we were against this but stated that there must be a way to cycle down and up again when the bay is occupied. Following our discussions, John Chamberlain sent the following response to Camden Council. Camden proposed a succession of possible solutions which are discussed in detail in our report on Junction St Pancras Way-RCS. Moving parking to west side south of Ivor Street for shops; we prefer the parking outside the contraflow cycle track but if it is moved, it is likely that motors will be able to pass the bus at the stop which we would object to. Loading bays in cycle track; CCC position : Loading bays in the cycle track are totally unacceptable on this route which is planned to encourage new cyclists who will not be happy to move out into the carriageway. Rail replacement bus stops; there is likely to be a continuing need for this space, we want another location to be found that is not interrupting a cycle route and provides a long-term solution. Wilmot Place now to be open with right turns; we would prefer Wilmot Place to be closed as originally proposed. If open, we want only buses to be allowed to turn right here; two-way cycling to be implemented through Wilmot Place and Jeffreys Street. Cllr Jones approved the scheme on 16th December 2014. Read about the deputations and the result in our news post.